Circle of Art Studios (2821 Thorndyke Ave. W.) was built on the Helenke family’s passion for art advocacy and communication through art. Run by Adam and Kayla Helenske, it offers a variety of services and is planning on expanding to offer a clay and ceramic studio. The studio now offers art classes, camps, open studios, art and wine events, birthday parties and art therapy counseling for all ages. Originally from North Dakota, Kayla previously worked as an elementary school art teacher and Adam was a studio potter for Pottery Northwest in Queen Anne. 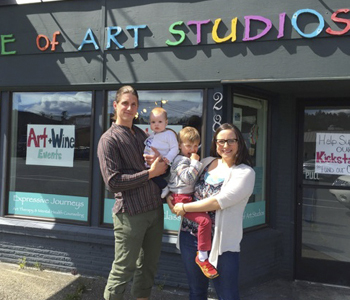 They opened Circle of Art Studios to combine both their artistic pursuits. Their studio is a reflection of their individual artistic pursuits and their combined efforts to bring art to the Magnolia area. Kayla uses art classes and therapy to communicate with children about deeper issues, and Adam showcases his passion for pottery in his display at their studio. The Helenskes are currently fundraising to install a fully equipped clay studio with kilns and pottery wheels. The goal is to bring clay and ceramic classes to the community. They are hoping to raise a total of $18,000 with a Kickstarter campaign that ends on April 28. The Helenskes own and operate the studio together, which also includes Kayla’s art therapy practice, Expressive Journeys Art Therapy and Mental Health Counseling, and showcases Adam’s ceramic work. Their two children — Madaak, 3, and Amarie, 7 months — make frequent visits to the studio, as well. Circle of Art Studios houses Adam’s pottery business, Helenske Clayworks. He is a professional potter and creates functional and decorative pieces. Most of his work is intended for everyday use in the kitchen or on the dinner table. He is very passionate about ceramics and has worked with clay since he was a child. A licensed mental health care associate, Kayla teaches the art classes and camps while maintaining her art therapy practice in the studio. She is working to become a licensed mental health-care counselor. Kayla’s teaching style encourages students to communicate and create with open-ended projects. She says she introduces an art medium to her students and allows them the freedom to create what they want with it. By integrating clay classes into her curriculum, Kayla hopes to offer children the chance to further explore ceramic creation in the same way she teaches her other classes. Kayla’s art therapy practice specializes in children and uses traditional talk therapy in conjunction with lines, shapes and colors to express the child’s frustrations and underlying issues. Kayla describes art therapy as using metaphors along with an art medium to reveal what is happening with the child. As their business receives more attention and support from community members, the Helenskes hope to diversify their client base to include older children and adults. They hope that offering clay and ceramic classes will give people a chance to explore the clay medium in a comfortable environment. “As we grow we want to be able to involve families from 1-year-olds all the way to the grandparents and really bring it together in that kind of family atmosphere,” Adam said. If they reach their goal of $18,000 the Helenskes will begin installing a clay studio and offer ceramic classes in the near future. For more information, visit www.circleofartstudios.com.